Iraqi officials say a wave of bombings and shootings has killed at least 91 people and wounded 172 others on the deadliest day in Iraq this year. Authorities said the attacks Monday included gunmen killing at least 15 Iraqi soldiers at a military base in northeastern Iraq as well as a series of explosions in the northern city of Kirkuk. 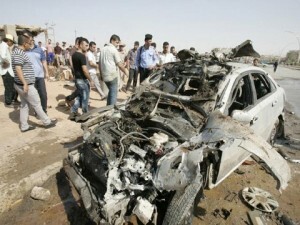 A car bomb also exploded in Baghdad, while other deadly attacks targeted Taji, just north of the capital.